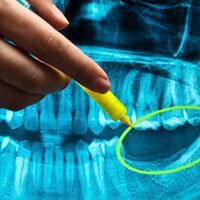 What is oral surgery and what does it offer? Oral surgery is one of the less attractive areas of dentistry, but it offers a possibility to compensate ‘the lost cases’. Implantology is a part of dentistry which has developed the most for the last few years. There are different types of implant systems, and all of them are made of titanium. Depending on the structure of the surface of the implant, there are classical implants and the ones for immediate loading. The difference between these two implant systems is in the time needed for osseointegration. It is required to wait 4-6 months to finish superstructures on the classical implant system, depending on the jaw, while with the immediate loading implants it is enough to wait 15-30 days. Typology of the patient determines the choice of the variety of the implant. Oral surgery also involves operations on teeth. Apicectomy can save teeth that do not react to conservative therapy. Granuloma and cysts are being removed along with a part of the root, saving the teeth that should have been removed. Roots that cannot be saved should be removed in order to make a place for the implant, or another type of a prosthetic substitution which provides functionality and esthetics of teeth.